"For nearly two decades, Paul Yao and David Durant have been acknowledged as experts on the Windows platform, so it's only natural that they would bring their experienced point of view to the .NET Compact Framework. With a unique combination of historical perspective and in-depth understanding of the subject matter, Yao and Durant take the reader through not only the technical guts of the Compact Framework but also the reasons behind the design decisions. "-Joshua Trupin, Executive Editor, MSDN Magazine "Yao and Durant have written a book that, although it assumes no prior experience with the .NET Framework, serves both the rookie and advanced programmer equally well. This is definitely a rare quality among technical books and is certainly not an easy thing for an author to accomplish. "-Doug Holland, Precision Objects "This is a very good hands-on book with plenty of sample code illustrating programming tasks and techniques, which any serious development effort for Windows CE or Pocket PC will require. "-Bill Draper, Director of Software Development"This book serves as both a great reference and tutorial when building .NET Compact Framework applications. My only wish is that it had been available sooner. "-Greg Hack, Senior Software Engineer, Allscripts Healthcare Solutions"Of the handful of books on Compact Framework, this book takes the cake. 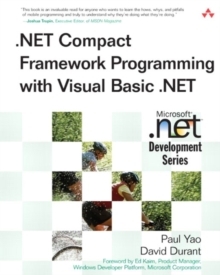 Paul Yao and David Durant's expertise with .NET Compact Framework is evident from their excellent and very insightful coverage of sections such as Building the User Interface, Managing Device Data, and Creating Graphical Output. The chapter discussing the topic of P/Invoke is unparalleled. After reviewing this book, I am certain that if there is one book that will help you understand .NET Compact Framework, this is the one. "-Deepak Sharma, Senior Systems Specialist, Tata Infotech Ltd."Yao and Durant's fresh, innovative, and in-depth look at the .NET Compact Framework gets developers up to speed using C# to develop robust and scaleable handheld software solutions. A definite must-read for mobile handheld developer enthusiasts! 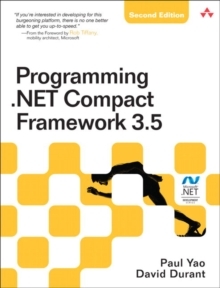 "-Andrew Krowczyk, Software Architect, Zurich North America .NET Compact Framework Programming with Visual Basic .NET is the definitive tutorial and reference for the .NET Compact Framework (CF). It shows you how to transfer your skills and your code to the Pocket PC 2003 and other mobile and embedded smart devices. 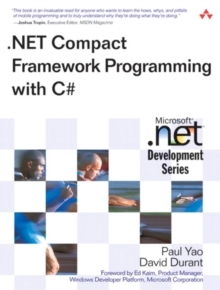 Authors Paul Yao and David Durant draw upon their years of research and experience with members of the Microsoft .NET CF team to show you exactly how the best CF programming gets done in Visual Basic .NET. This is the only book a programmer needs to master the art of CF coding. Throughout the book, sample code and examples illustrate best practices and programming techniques. In addition, the companion Web site includes downloadable code for all these examples, along with a set of development tools to help you with your CF development projects. The authors expertly zero in on what programmers need to understand for successful smart device programming, including:Garbage Collection in the .NET Compact Framework Controls and supported Properties, Methods, and Events (PMEs) Custom controls with Windows Forms Designer support Using Platform Invoke (P/Invoke) Simple and complex data binding and the DataGrid control Programming with ADO.NET data classes Synchronizing SQL Server CE with SQL Server 2000 databases Creating graphical output, including font and printing coding tricks Differences between the standard desktop framework and the CF.NET Compact Framework Programming with Visual Basic .NET is your single resource for everything you really need to know about CF programming.